Wolf Cub slots is a fantastically designed online game, released by Net Entertainment. It contains cartoon-styled graphics and animations that are quite appealing. The slot is playable with the minimum and maximum bets of £0.10 and £100.00 respectively across tablet, desktop and mobile devices. It also offers some interesting bonus features, alongside a huge winning potential. This slot comes with 5 reels, 3 rows and 20 fixed paylines. The reels are set against the backdrop of a snow covered forest. The players can also view the snowflakes that drift gently to the ground behind the spinning reels. It also features a very cute wolf cub who is sitting on the left side of the screen and watching the slot game’s proceedings. 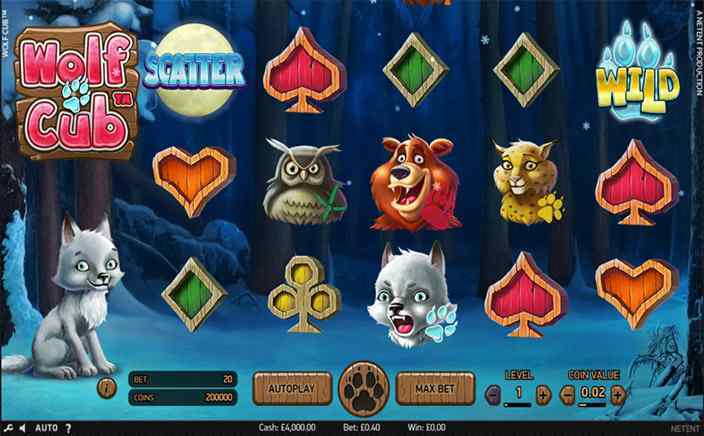 The slot game contains 5 higher value symbols which are a bear, a wild cat, an owl, a moose and a wolf cub whereas, the lower value symbols are spades, diamonds, clubs and hearts playing cards that are carved out of the wood. On the other hand, the snowy wolf print is considered as the wild symbol that can substitute all the others, except for the full moon scatter symbol. The higher value symbols in the slot offer nice payouts to the players. An old owl can pay about 7.5 times of the player’s stake whereas, a wild cat, a moose and a bear can pay up to 10,12.5 and 15 times of the player’s stake respectively. 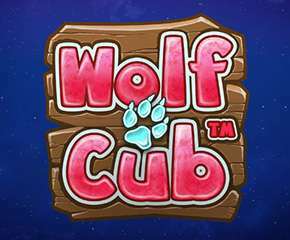 The wolf cub is the most rewarding symbol, as it can pay up to 30 times of the player’s stake by landing 5 of them on the payline. This will get activated by landing 3 or more full moon scatter icons anywhere on the screen. All the reels that contain at least three scatters, will now spin and every position will reveal the number of spins. These numbers are then added together, to provide the players with the total number of free spins that they can play with. In fact, there are about 115 free spins that can be won. It comes into play during the free spins round. This feature gets triggered whenever a symbol lands up fully stacked, upon reel one. Now, all the symbols that match up to the stacked symbol elsewhere upon the reels, will spread towards reel one to provide more of the similar symbol. This applies to the wild symbols too. Wolf Cub slots is a nice looking slot game, that is becoming popular amongst players across the globe. It also succeeds in providing a good gaming experience, and has a decent RTP is 96.34%.